The idea of stringing tennis rackets for a living does not appeal to everyone but if you are a tennis player and want to explore the idea of starting a stringing business than read on because I am going to spell out the steps in a simple systematic way so that you can follow the plan and be up and running in 30 days or less with your own racket stringing business! Seriously...this article is for anyone who has a desire to string tennis rackets and no experience required. $500 dollars to an underemployed high school student might seem a reach but for young entrepreneurs, college players, tennis parents or just about any other level of tennis fanatic this should be a reachable figure. I am going to take you through the steps to getting your stringing business operational in 30 days or less. First and foremost we will start with acquiring the biggest investment and most likely the one crucial component here - the stringing machine. With a budget coming in under $500 dollars we will need to be diligent in our research to find a stringing machine to meet our needs because we will need to use some of our funds to buy other things as well. An initial search on Ebay pulled up 40 active listings of which about 30 where stringing machines and the rest were stringing machine components. Of the 30 stringing machines only 11 met our price range of $100-$400 dollars. The title of this article is "Can I start a racket stringing business for $500?" and I will stay within this budget. 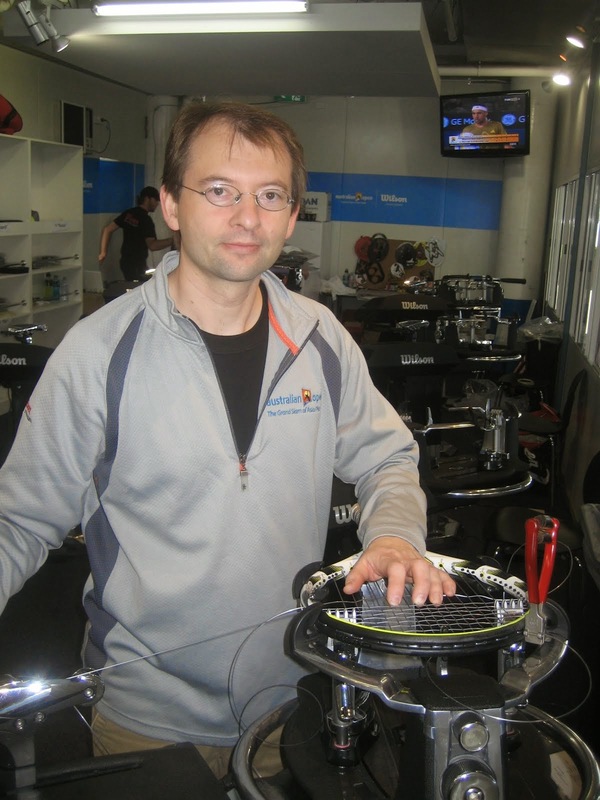 In order to learn more about the machines and what we can expect for our money we visit Racquet Sports Industry Magazine August 2011 issue for an article about stringing machines. This article will review stringing machines from 12 different manufacturers and describe the features and what we should be looking for in a machine. By looking at the article we can see that the majority of the machines are out of our price range but it gave us an idea about what to look for. Most likely we are looking at a table top model, drop weight but maybe if we are lucky we can find a spring release model. You can follow up on some options by clicking the links. 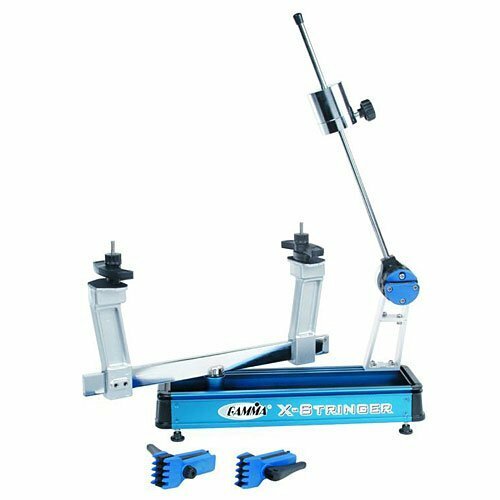 Gamma Progression 200 Stringing Machines -$159.00, Gamma-X-2-Stringing-Machine- $230.99, Gamma X-6- Stringing Machine - $349.00, Klippermate Stringing Machine -$159.00. The klippermate will come with the basic stringing tools and the floating clamps, I will save purchasing the string until the end based on the money remaining from our original $500 dollar budget. RUNNING TOTAL: $159.00 spent so far. The next step will concentrate on learning to string, joining the USRSA (United Racket Stringers Association), setting up the business license, purchasing marketing materials, setting up the website and advertising. It sounds like a lot but don't worry its pretty straightforward. The annual membership for the USRSA runs $119.00 dollars annually and it includes all the materials you need to get started learning how to string, learning stringing patterns, access to discounts,etc. They invite you to a temporary 1-month membership for $9.00 to try it. You will find this membership to be valuable the first several years that you learn to string and build your business. Add the $9.00 to our running total and we have $168.00 spent so far. As you progress as a racket stringer and your competence in stringing improves you might also look to become a certified stringer through the USRSA. The USRSA is the only certification organization for stringers in the USA. The MRT certified stringer program is the industry standard and demonstrates to your clients that you basically know how to string. I first became a MRT back in 1996 and it has served me well over the years. I still display the certification proudly in my stringing shop. Once you join the USRSA you can then also use the USRSA member decal and logo on your marketing materials, website and business card to add credibility to your name. The next step is to create a legal business structure for your business and there are two reasons that I think this is important. First, if you are conducting business you need to create a legal business name or a business under your own name and pay taxes on your profits, generally when starting out the 'sole-proprietership' is the structure many individuals choose. Secondly, in order to get trade accounts to purchase strings at wholesale you will need a resale number and you generate one by structuring your business legally. (this article is not to help you create a legal business so please consult with your city and state for proper business licensing requirements). Generally a business license runs around $60 dollars to start. Running total now increases to $228.00. Decide on a business name or even "Randy's Stringing Service" would do, create business cards and an Internet presence. I have always felt that printing your own business cards is a waste of money and looks cheap, there are numerous printing places such as Fedex printing or online printing businesses such as VistaPrint that will do a professional printing job and pretty quickly too. I have used VistaPrint for numerous printing jobs over the years and have always received a quality item. Upon this writing, I visited the website for VistaPrint and found one-sided / color / matte finish business cards as low as 13.99 for a quantity of 250 + shipping. Running total with $30.00 for printing business cards increases to $258.00. An ONLINE PRESENCE is also important so that your customers can find you and it can serve as your point of contact with perspective and current customers. If you feel like a newbie to the online world than starting a free blog or site might be the ticket. You can visit Google's blog platform called 'blogger' and basically sign up for a free account, enter a URL and it basically does the rest. The design process will be fairly simple with plug ins and widgets for everything you need. You can add your contact information and highlight your experience, show your potential customers more about your service and string offerings here. If you have more experience online than setting up a website with a twitter and facebook connection might be the way to go. Having a Facebook fan page for your business and a Twitter account will also help you market your business via social networking. You can also visit Craigslist in your local city to promote your business (be sure to read Craigslist business guidelines first). Miscellaneous expenses will also add up including an inventory management system (business cards and file folders). Keeping your customers contact information, email address, racket type, string preference, tension, stringing date,etc. will be important for you to keep. A portable label maker will also be important in order to create your custom racket labels. For starting out you can probably get away with using the preprinted labels that come with the string sets. Total cost added to the running total is $20.00 so the total is $278.00. The remaining money will be spent on purchasing string and a few stringing tools. Generally when starting out we will need to get a pair of clippers ($2-3 dollars at Walmart or a nearby Pharmacy) and string cutters ($10.00) used for cutting strings out of the rackets, so this will leave us with $210 dollars to be used for buying string. At this juncture you probably don't need to set up any accounts with manufacturers or retails that offer a wholesale account. You can look to places such as Craigslist or Ebay to purchase some strings. If you structured your business legally and have your resale account you can purchase your stringing needs at online sellers such a Fromouth, Rocky Mountain Sports, ATS Sports, Tennis Express or Tennis Warehouse to name a few. Also you might find that if you order $75.00 or more you will get free shipping ! Although I have some accounts with manufacturers, I like Rocky Mountain Sports because of their monthly specials. Every month they will offer some deals that usually are pretty sweet. I tend to buy some strings on eBay as well. I like to look for dealers that offer low shipping costs as well. WHAT TYPE OF STRING TO BUY. Since you are starting out and you will need to spend hours practicing stringing you will most likely go through a reel or two. Buy the cheapest nylon reels you can for practicing. I saw a reel of Forten Nylon 660 reel for 16.00. A reel of 660 feet is usually good for 16-17 frames. I would recommend offering some strings that are popular and that cover a wide range of needs. You will need to purchase some polyester strings, basic nylon and multi filament strings and have some in 16 and 17g. Buy some basic poly's such as Gosen's Polylon in 16 or 17g, a few sets of Babolat or Luxilon strings, Wilson NXT or Technifibre NRG2 or Biphase, a few sets of Prince Duraflex in 16 or 17g and some Gamma TNT as well. Check out the various online retailers and look for their specials as well. I hope you found this article to be helpful. I think we achieved our goal and found it was possible to start a racket stringing business under $500. With practice you will improve, get your racket out and start stringing. Watch YouTube videos on racket stringing (this will help you tremendously, some videos are crap but you should find some great ones as well). Please bookmark this site, share it, link to it, email me and have fun. Please email me with questions, comments. Hi Patrick, I'm thinking about jumping into the business and buying a Klippermate. 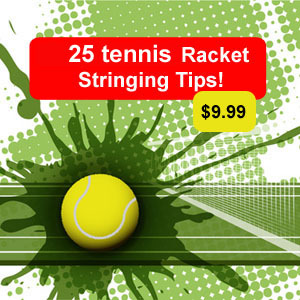 What can a person charge for stringing a racket? Where can I find customers in my area, the article mentioned craigslist? 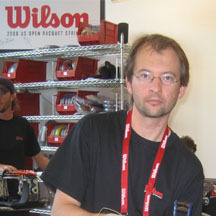 How often do a players rackets need re-stringing? I'm assuming you make a pretty good living in this business. How much can a person make a month once they build up their business?